This attractive display is supported by great signage listing the wines. Kudos! Last time I counted, there were a few dozen points you need to meet in order to ensure your silent auction rocks. Covering all of those would make for a hideously long blog post, so I’m going to talk about a mere three. One of the smaller auctions I work has about 200 guests. Year after year this group has consistently managed to make their silent auction adorable. One point they do exceptionally well is to offer fetching displays with clear signage. Take a look at these 12 wines, none of which are overly expensive. 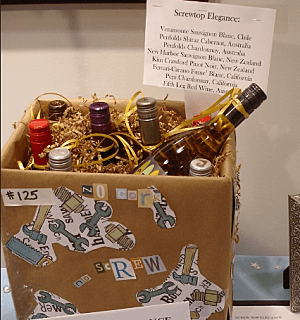 Tagged as “Screw Top Elegance,” the fun box flirts with bidders. But the nonprofit doesn’t rely on that alone. They provide clearly displayed signage listing the wines to make it oh-so-easy for guests to understand the package. Why is this bad? Because you think the candlesticks are for sale, and they aren’t. Two years ago I worked a silent auction in a five-star property. Many aspects of the evening stung my heart. The committee was short on volunteers so despite securing some nice donations, many items never reached their sale potential. Case in point: Look at the right photo. 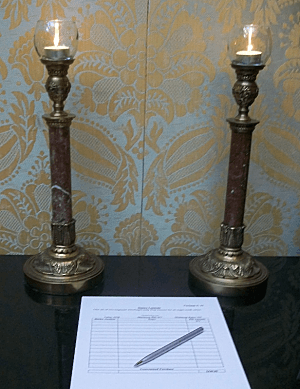 See those lovely candlesticks with the bid sheet in front of them? Read that bid sheet and you’ll learn that dance lessons — not candlesticks — are for sale. Those candlesticks were part of the hotel’s decor and happened to reside on that table. How many items can you fit on an 8′ table? More than I ever dreamed! How many items can YOU squeeze onto a silent auction table? Probably not as many as this group. Crowding and doubling up items on a table isn’t a good way to present your packages. Sometimes our silent auctions are limited by the amount of space we have. Either we need to ante up and rent a larger venue, or scale down the auction. 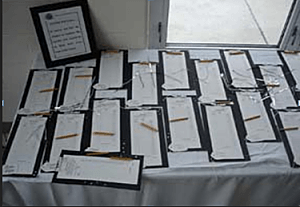 When presented with this silent auction table, guests can become overwhelmed. Some won’t stop to look at any items. Others might stand in one spot forever, preventing others from viewing. Space it out to spiff it up. You’ll have a stronger bottom line performance. Great post. I hadn’t thought of this but I think some of the worst silent auctions I’ve been too were sheets of paper flat on a table. Not as packed at the 8′ table example, but similar! One of the best was done to help a friend get to Ethiopia. Despite oppressive heat in the house and a packed house, the items were well laid out. Things were vertical and horizontal. And items that weren’t in the room had pictures to draw people to them. Thanks Sherry for these tips! So many people take the display part of an auction for granted – the presentation can make a huge difference! I’m with Marc, I hate having to bend down to read all the fine print. Sherry, I really liked your first example. A display doesn’t have to be expensive to be eye-catching. Also, let the more creative folks on the committee come up with display ideas. It’s a job they love and they do usually come up with the best stuff! Sherry – Thanks for the great examples with photos! So often, a silent auction is run by well intentioned volunteers with little or no experience. Your practical tips will certainly help them every time! We’ve had 5 auctions at our events and are always looking for ways to improve. Ours is a long outdoor event with an auction added to it, so there are unique challenges! I appreciate your tips here because they apply everywhere! Welcome to the blog, Gina! Enjoy ….